Palantype or Stenography machine, they are very similar. Stenography is American Palantype is British. The former has less keys than the latter, making certain words ambiguous as both machine use Phonetic sounds as a means of typing information, similar to shorthand, but typed instead. Palantype machines can differentiate certain words better because of the extra keys. In spite of this the Palantype was less favourable amongst users and fell out of favour. Words can be typed on these machines at over 200 words per minute. They can often be seen in movies containing courtroom Dramas as the spoken word could be recorded quickly. Time stamp for items such as documents received at a Solicitors office for legal purposes. This machine has wooden keys and is poor condition but all the marks and transfers still remain. 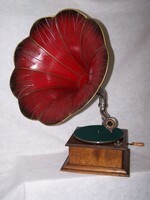 Its Serial Number is 159,878 so it is probably made in the early 1900's. The type is struck on the paper from underneath so the typist cannot see what has been printed without raising the Carriage assembly. Later this method was abandoned, due to pressure of competition, and replaced by front typing where the result can be seen. Remington was the first to make the under-typing model after purchasing the rights from the inventor Christopher Laythem Sholes in 1876. By 1882 the name Remington was a brand only, Wyckoff Seamans and Benedict were producing them and bought sole rights to make the machines 3 years later. This machine is in working order. This was the only full-keyboard front strike typewriter ever built. When the Smith brothers' typewriter business ceased the name was bought by Remington who continued to make Smith Premier machines, including the No. 10(SP10). The new Smith Premier (Remington) factory was opened in 1908. 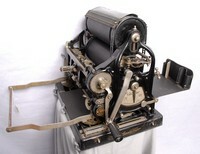 The Smith Premier No.10 with the new visible typing method was produced at the factory in addition to older up strike type machines which were still in use. Production of the No. 10 continued until 1921. The Remington Junior was also built here. Production of the Royal No 10 started in 1914. It had glass windows on each side so you could view the workings; earlier models had two on each side, later types had only one. The Royal company were so confident of the strength and reliability of these machines that they dropped them in a crate from air planes as a publicity stunt to prove that they would still function after such abuse. The Underwood No.5 typewriter was first produced in 1901 by the Underwood Typewriter Company of New York. It was designed by a German-American, Franz X. Wagner, and was the first typewriter with a reliable 'front strike' mechanism which allowed the typist to see what was being typed. 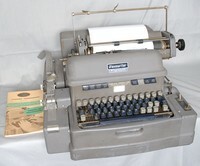 It was also faster than other designs of the time, operating effectively with a lighter touch, and had shift keys for caps and lower case letters, plus a tabulator key. Burroughs produced more calculators than typewriters, this is their Electric carriage return machine that continued in production for many years but did not alter much in that time. Its advantage was that the carriage assembly could return automatically, other than this it was just a standard typewriter. Imperial typewriters originated in 1908 in England and were made until personal computers became popular in the 70�s. The company was sold to Litton Industries in 1966 and the typewriters were no longer made in England as of 1974. This machine was made during or shortly after WW2 when factory's were being used for the War effort and the normal Stove Enamel was in short supply. In 1954 Imperial announced a new machine, the 66. In 1967 they began to import cheaper machines from Japan and in the 1970's they were taken over by Litton Industries the American electronics company who also took over the Royal Company. Soon after the imperial name disappeared altogether. The spools on the sides are for typing onto a tape. In 1865, Rev. Rasmus Malling-Hansen of Denmark invented the Hansen Writing Ball, which went into commercial production in 1870. Instead of a 'basket" of pivoting type bars the Selectric had a pivoting type element (often called a "type ball") that could be changed so as to display different fonts in the same document, resurrecting a capacity that had been pioneered by the moderately successful Blickensderfer typewriter sixty years before. One of the main advantages of the 'Ball' writers is removal of the problem of type bars becoming tangled due to by pushing two or three keys grouped together at the same time or by very fast typing, (particularly on poorly maintained machines), caused by working the machines faster than the bars could relax. Able to punch cards or tape using 5 bit code (tape has five readable holes per character). Its uses included fast transmission of telegraphy messages, paymaster data storage, or control of automatic equipment in a factory. An electromechanical calculator that will perform the four basic mathematical functions automatically. An Odhner-type rotary pin-wheel machine. This machine is fitted with a very useful back-transfer mechanism actuated by the small red lever at top right. This transfers the number in the result register back up to the setting register so that it can be used in further calculations. AB Addo Is a Company in Malmo Sweden, with a subsidiary in England, they merged with a Company called Facit around 1968. This machine was probably assembled in this country. It will only add or subtract and can be used for old English money, or decimal. Mechanical calculating machine driven by three handles, Modell 117 Fabr. Nr. 353974 Made in Switzerland. Thanks to Kadri Balakci for identifying this model. This is a copy of the original 'Brunsviger' calculator invented by E.T.Odhner in 1890. It is very heavy and quite complicated to use. Italian Olivetti mechanical calculator popular in the 1960's. Prints on paper by pulling handle down. The comptometer was invented by Dor Eugen Felt in the 1980's in America. Dorr E Felt started his first prototype during the Thanksgiving holidays of 1884. Because of his limited amount of money, he used a macaroni box for the outside box, and skewers, staples, and rubber bands for the mechanism inside. This prototype, called the macaroni box, is in the Smithsonian Institution in Washington, D.C. Units like the one shown were leased in large numbers by companies such as Sumloc Comptometer, who Purchased the rights in England in 1960, until electronic adding machines replaced them. See Item A1157. The machines worked by adding only and other functions were completed by progressive use of the keys. Similar to the Sumlock machines leased by the bell Punch Company. Not all Comptometers are of Bell Punch origin. Many were made and marketed by others, whether Bell Punch had there own manufacturing base for there machines is not clear. This model Model L.C. 912/SF/6069 of unknown manufacture could have been made in America and imported, then leased (as they usually were) by any number of companies. This machine is Marked 'The London Computer Corporation'. This Model No 509/S/94.317 and models like this one were leased in large numbers by companies such as Sumloc Comptometer, until electronic adding machines replaced them. The machines worked by adding only and other functions were completed by progressive use of the keys, ladies often complained that the long strokes of pushing down the keys broke their finger nails. The curator of this museum used this model when she worked at Marks and Spencer in the 1960's and had the reputation of being the quickest operator in the office. The Plus and Sumlock are machines of the "Comptometer" type; the Sumlock being the full-keyboard version and the Plus the abbreviated-keyboard version. They are intended primarily for addition, but can also be used for subtraction, multiplication and division using learned techniques. The main feature of this type of machine is that it has a full-keyboard and is "key driven", which means that pressing any key immediately adds the number on that key to the number displayed in that column, with carrying to the next column taking place where necessary. The machine is designed so that keys in different columns can be pressed simultaneously. This means to add the cost of several identical items the operator arranges his or her fingers on the required keys and then depresses them all simultaneously the number of times for the number of items. Working in this way this type of machine is much faster than a 10-key type of machine where each digit has to be entered successively. In 1960, the Bell Punch Company bought the British rights to the Comptometer design and trademark, and continued its development. In 1961, Sumlock, a division of the Bell Punch Company, was renamed The Sumlock Comptometer Ltd, and began marketing the first all-electronic desktop calculator, the ANITA Mark VII. The entire calculator division of the Bell Punch Company was bought by Rockwell International in 1973. Unfortunately they exited the calculator business in 1976 and shut down all operations. Not all Comptometers are of Bell Punch origin. Many were made and marketed by others; whether Bell Punch had their own manufacturing base for these machines is not clear. See Item A1157. In 1960 the Bell Punch Company gained the right to the name Comptometer from the U.S. Comptometer Corporation. This is Sterling currency Comptometer, with 10 � decades, shillings, and pence. Note that the pence column does not have keys 1 to 11, only the standard number of decimal keys (1 to 9) so to enter 10d or 11d the operator has to successively press two keys to give the required figure. From left to right there are 9 columns of keys for Pounds, 2 columns of keys to give up to 20 shillings, and one column of keys to give up to 12 pence (there are only keys 1 to 9 so to enter 11 pence, for example, you have to press e.g. 5 and then 6). The name Comptometer has become synonymous with this type of calculator by whoever made them. In 1957 the Felt and Tarrant Manufacturing Company changed its name to Comptometer Corporation and in 1960 Comptometer Corporation sold its UK operation, including the right to the Comptometer name in Britain, to Control Systems Ltd, the parent of Bell Punch, which merged it with its own company to form Sumlock-Comptometer. Comptometer Corporation then contracted with Control Systems to have all its machines made by Bell Punch in England and shipped back to the U.S.A. This resulted in all Comptometer production ceasing in Chicago in 1961, and in machines from Sumlock being marked with the Comptometer name. Although these machines were very successful and thousands were sold, only a few companies manufactured the "Comptometer" type of calculator. The main manufacturers were Felt & Tarrant (later Victor Comptometer) and Burroughs in the U.S.A., and Bell Punch in Britain. This calculator uses 10-digit "Nixie"-type tube display, and memory, In 1970 it cost �431. With Square root capability. 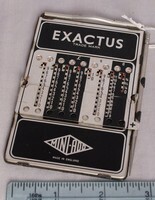 The electronics is similar to that of the Anita 1011. It uses mainly transistors, but also has integrated circuits made by Marconi-Elliott Microelectronics using "MOST" (Metal-Oxide Semiconductor Transistor) technology. These machines were marketed by Sumlock-Comptomter in the UK. ABM electronic calculator of the 1960/70's with printer and illuminated display. Cambridge calculator, the first of seven calculators produced by the company. This model was launched in August 1973 and cost �29.95 + VAT. Also in kit form for �24.95. Weighing less than 3.5oz. Nowadays we can get calculators for �1.00, how times change. A mechanical pocket calculator for addition and subtraction of pounds shillings and pence. The calculator is made from pressed metal and enamelled in black and silver. The calculator consists of eight columns of figures and operates by using a stylus to move the metal slides inside each of the columns. When not in use the stylus clips to the side of the calculating machine. The calculating machine has a hinged metal panel that flips up when in subtraction mode and down when in addition mode. At the top of the calculator there is a metal handle that also functions to zero the calculator. 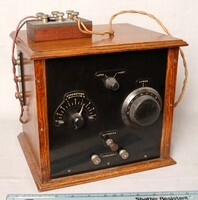 (see Item No A0226) positioned in the Houses of Parliament, the transmitter was activated when it was necessary to call the M.P's to the house when a vote was needed. The bells would be in all the bars and meeting places that the M.P's were likely to be, if a vote was imminent then the members were obliged not to stray far from a bell, usually no more than a mile away. The local MP did say these were still to be seen in the House of Commons. It has been said that this transmitter was used to ring the Division Bell in the Houses of Parliament and that one of the units was destroyed by a bomb during the Second World War; this however is unit No 2 and is alive and well. Only five units were made, so we believe. When offices started to use the Dictograph, the main drawback of the system was the need to install extensive wiring, and businesses were reluctant to change to such an expensive system to replace their tried and tested speaking tubes. 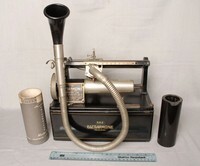 Lamson Engineering was a major worldwide provider of office equipment at this time, and added Dictograph to their range of products. The suggestion may have come from Lamsons that Dictograph should rent their systems rather than sell them outright, and spread the buyer's cost over many years. By 1908 Dictograph systems rented from as little as five dollars and fifty cents a month for one master console and five stations. It was not an original idea. Companies in England such as General Electric had already launched into the rental market in the late 1890s , and the New System Private Telephone Company began in the late 1890s as well. Telephone Rentals began in 1902. The Grundig EN3 is an early attempt to put all the functions required of a voice memo recorder in one box. It's a truly hand-held machine, somewhat larger than a modern mobile phone. The microphone is plugged directly into the top of the machine and includes an integral recording level meter. The tape is controlled by a single red lever, just visible in the photo on the left of the machine. The three AA batteries are hidden under the tape cassette. Production of the range of Adana machines was between 1935 and the 1950's, and the 'Adana Agency' was founded in 1922 in Twickenham by Donald Affleck Aspinall Adana. All the machines were destined for the amateur market. Up to 40 sheets can be printed on these machines in one minute by an inexperienced operator, once the type has been placed and put onto the machine. Type is held in place by a box frame called a 'Chase' using blank spacers called 'Quoins' to pack out the complete area. When printing rollers move up onto a round disk covered in ink which revolves slightly on every press of the handle. Once the ink is on the 'form' (the completed 'Chase') the bed holding the paper ('Platen') to be printed is pressed hard onto the 'Form' and then removed after the handle returns to its rest position. The 85 refers to the size of the flat bed on which the type set is placed - 8 x 5 inch. This machine was made after 1953 and cost �16.80. Donated by Mrs Kathleen Williams, this printing press belonged to Kathleen's late husband, it was in constant use.